Today we are are interviewing T.K. Lukas about her novel "Orphan Moon." 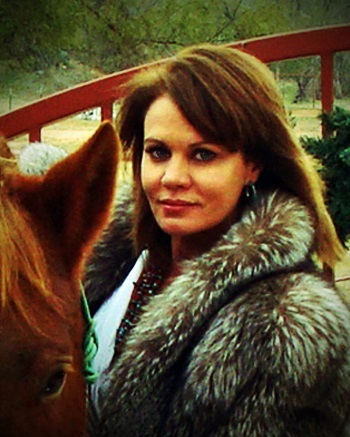 I’m a native Texan and a life-long horse owner, breeder, trainer and all-around equine enthusiast. I think this helps me to write convincingly and with an authentic voice about life on the rugged western frontier. My husband and I live in North-central Texas where we raise cattle and spend as much time as possible sitting in a saddle. When not busy with ranch chores or up in my office writing, I enjoy snow skiing, photography, and traveling with my husband, especially if we can sneak in a horse-back-ride in whatever country we happen to be visiting. Describe the plot of your new book, "Orphan Moon," in a few sentences. A young woman, Barleigh Flanders, faces extreme personal tragedy and has to come up with a plan to save the one thing she has left: her land. Her plan is reckless and foolhardy, yet it’s her only hope. She gains an unsought ally in her scheme, an ally in the form of Texas Ranger, Hughes Levesque. They both must overcome dark secrets from their pasts, and their paths have surprisingly crossed in a complicated twist of fate. It’s the untwisting of the path - of the past - that leads Barleigh to face a choice between completing what she’s set out to accomplish, which is saving her land, and trusting this man enough to allow him into her life and into her heart. That’s a tough question. When I first wrote the book, I envisioned it being for a “New Adult” audience, especially women in their late teens to mid-20s embarking on their first sexual encounter. However, I’ve had such positive response from people of all walks of life, from an 87-year-old German male, a mid-30s male, many young women, ladies in the 55-and-up age category, a retired Mayor (gentleman), etc... It’s been wonderful seeing the reviews come in and to know that the story doesn’t exclude anyone. I will say, though, that because of strong language, it’s definitely not a kid’s book. What inspired you to write about a young woman who has to move forward after tragedy? Two things. My first inspiration was my grandmother, who is no longer with us. Yesterday, June 13th, would have been her 113 birthday. She died at 98. She was burned severely as a young girl before the days of antibiotics and modern medicine and wasn’t expected to live. She was a fighter and never gave up. She did recover and lived a long life. She had nine children, three of whom she had to bury, and always kept a positive, never-give-up attitude. Always had a smile and a kind word for everyone she met. My second inspiration was when I lost everything I owned several years ago in a house fire. It was a dark time in my life, I was in a very bad relationship, and I had to face what was important and what was not. I learned a personal lesson that material things can go up in smoke in an instant, and toxic people in your life have as much value as the ashes left behind. What’s important is moving forward. Rising from the ashes. Being the proverbial Phoenix. Tell us a bit about the protagonist, Barleigh Flanders. Barleigh is a girl with gumption. She has a big heart. A strong moral compass. But, she’s also very quick to make rash decisions without thinking through the consequences. This impetuous behavior gets her into trouble on more than one occasion. She’s feisty. Spirited. And she’s very much willing to do whatever it takes to save her land and make a home to raise her half-sister. Thrown into a man’s world, yet she retains her feminine vulnerability, a quality that ultimately causes her to face her day of reckoning with the dashing gun-slinger, Hughes Levesque. “Orphan Moon” is a book that seems to transcend genre, part western, part romance, part literary fiction, part action/adventure. Did you decide to incorporate all these elements from the start? Or is this something that developed as you got deeper into the story? These elements have been a part of "Orphan Moon" from the get-go. Researching the Pony Express began over three years ago, and as I dug deeper into that, I began forming the idea of a conspiracy regarding a plot to steal the mail and President Abraham Lincoln’s letters to California – hence the action/adventure element. I knew all along that I wanted there to be a romantic element. I mean, every daring cowgirl wants to fall head-over-spurs with a handsome cowboy! It is definitely set against the backdrop of the rugged western frontier. And the fact that it has been described as literary fiction is flattering. Hughes Levesque becomes an unlikely ally for Barleigh. What draws him to protect her? First, he makes a promise to an old friend to protect that friend’s daughter. He’s a man of his word. However, his word and his heart get tangled up in a battle of wits when he finds himself struggling to keep another promise to that same friend – that he’d keep that friend’s identity a secret. Hughes thinks Barleigh needs to be told the truth about her mother. It’s a huge inner struggle for Hughes, a man who always keeps his word, even if it kills him. I love the writing styles of Larry McMurtry, Cormac McCarthy, and Patrick de Witt when it comes to telling a gritty western. Others I’ve always admired run the gamut of genres, from Ernest Hemingway, Harper Lee, and Annie Proulx, to name a few. Oh my goodness - besides Barleigh, I LOVED writing Stoney’s scenes! He was so much fun. I have four uncles on my mother’s side of the family, and Stoney is a compilation of them. We had a family reunion over the weekend, and we had such a great time talking about the character of Stoney and how he reminded everyone of our uncles…and the memories and stories just flowed. I’m a huge fan of ebooks. It’s revolutionized the industry of writing and bringing an author’s books to the reader. And as a reader myself, I love the convenience. I will say, though, that I love the nostalgia of holding paper in my hand. I love looking at print. Ten years? I’m focusing on the next two, at best! Seriously, my immediate goal is to finish books two and three of the "Orphan Moon" trilogy, and to finish a contemporary suspense I’m working on. As far as the craft of writing, my goal is to continue to improve by taking classes, going to writers’ retreats, entering contests, etc… Long term, signing with an agent is on my radar. The only aspect I don’t really care for is that it’s sedentary and a mostly indoor activity. I’m an active person. I start getting antsy. I start looking out the window wondering if my horses aren’t missing me and maybe I should pay a visit to the barn… Often, I carry my laptop to the patio and work outside. That helps a bit. I have had writer’s block. I envy (and suspect) those who haven’t. I deal with it in various ways. Take a jog. Go for a horseback ride. Research a topic. Read a book. Re-read the previous chapter and find a new way to edit…. Something to get the creative juices flowing. I write on a computer because of its technological capabilities. Editing is fast and easy. Researching is a snap. But, I keep a pen and paper at my bedside and at my bathroom vanity, for quick notes. Also, I use the “note” feature on my phone for when I have a burning idea and my computer is not available. I’m two-thirds of the way through my next project, a contemporary suspense thriller titled “IF THE DEVIL HAD A DOG.” The release is targeted for September 1st, 2015. It’s about a very smart lady who finds herself in a nasty divorce from an evil man. Her divorce attorney advises her to disappear for a while. She heeds the warning and flees to a destination in west Texas that was recommended. There, she encounters a former US Marine turned CIA operative who can help her disappear for a while. He can help her with a lot more than that. It’s an edgy thrill ride packed full of heart-pumping suspense. 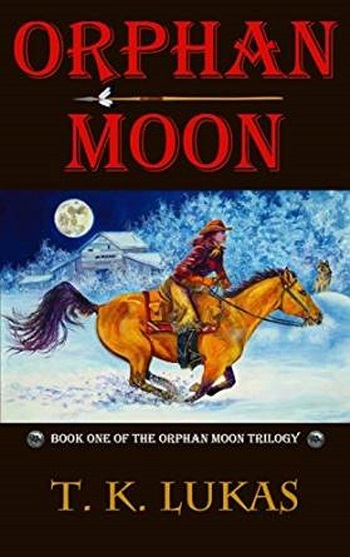 "Orphan Moon" is a story that I think readers will fall in love with, whether they identify with typical westerns, or horses, or cowboys and cowgirls, or not. It’s a life-lesson in knowing who you are and what you’re willing to do to get what you want. Better yet, it’s a life-lesson in knowing what you won’t do, what your boundaries are, and holding true to yourself. It’s good against evil. It’s a love story, although it’s not the classic knight-in-shining armor story. Our plucky protagonist, Barleigh, knows what she wants, and ultimately, when it comes to love, she’s not afraid to say so.